Saint Peter, MN— Theatre Honors Alum Kimberly Braun ’11 is performing this month with the Iowa Theatre Artists Company in Amana, Iowa. Braun is playing the role of Callie Belle Hurt in “A Southern Exposure” by Kelley Kingston-Strayer. The performances of “A Southern Exposure” are November 11 through 27. Fridays at 1:30 p.m. and 7:30 p.m., Saturdays at 7:30 p.m. and Sundays at 1:30 p.m.
“A Southern Exposure” is a charming comedy by Kingston-Strayer and is witty yet poignant, addressing universal themes of family, love, and loss. 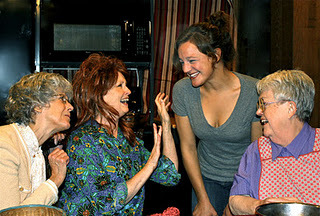 Callie Belle Hurt falls in love and wants her grandmother and her two aunts to approve. The relationships between these women are touching and the comedy in the quick dialogue is sharp and entertaining. “A Southern Exposure” is a four woman show featuring Braun, Cherryl Moon Thomason, Marty Norton and Meg Merckens.